I’m pleased to be covering the 6th Annual Israel Film Center Festival at the Marlene Meyerson JCC Manhattan, which runs June 5th-12th. The most powerful way to preserve the memory of the millions of people who perished in the Holocaust is to continue telling their stories and passing them down from generation to generation. Efforts to record testimonials of those who survived have been made by many, and as more interviews are conducted, surprising and unexpected revelations are made about the extent of what occurred. Survivors may choose not to share certain points they find to be humiliating or disturbing with their descendants and friends, and learning that something believed to be a truth for years isn’t actually entirely accurate can have disquieting effects. 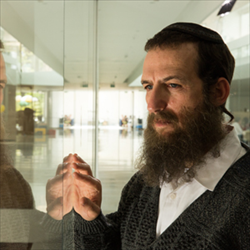 Yoel (Ori Pfeffer) is a religious man who works as a historian, and his latest project involves proving the existence of a mass grave of Jewish people killed during the Holocaust in Austria that will affect construction slated to begin shortly. In the process of his research, Yoel discovers something truly shocking – that his mother is not who she has always said she was, and is not even Jewish. As he presses on with his work, Yoel finds himself experiencing a deep crisis of faith in the weeks leading up to his son’s bar mitzvah. What Yoel goes through is a purely internal process. When he shares in a panic with others close to him that he now knows that he is technically not Jewish, they respond dismissively that he is crazy or that it doesn’t even matter since he has grown up his entire life believing something and something from the past shouldn’t change it. But for a man who every day argues against those who tell him that what he knows to be fact is not, this is a crushing blow, and one from which he cannot hope to recover without changing something in his life. Pfeffer, who has appeared in English-language productions “Hacksaw Ridge” and “Dig,” delivers a sobering, lived-in performance as Yoel, who is so committed to getting to the heart of the matter that he can’t let anything go, even if it bothers just him and no one else. This is a film that strongly utilizes interview footage, letting the weight of the words uttered and stories told speak for themselves. This specific circumstance probably isn’t unique to this character, and this film carries a powerful message about the power of memory and history, especially when the two don’t line up.